Set the tone for your message with this high resolution graphic from the "Bridges" series. At 9:56, this Happiness Is themed countdown clock is used to communicate the planned start time of the service for the series "Bridges" to the audience. This message opener was created to promote Ed Young's series "Bridges." Used in the series "Bridges", this short film is about a women who is on an island and enjoys the feeling of being free but she soon realizes that she isn't free but she is trapped. This shows that whenever you think you have it all together, you truly do not. This short film is intended to be used as both a short film and a song background. The download includes two versions: a shortened version, as well as an extended version with additional footage accompanied with a click track. The click track matches the tempo of the song "Message In A Bottle" by Sting. The preview video shown is the additional footage with click track. A song background that is accompanied by a click track which matches the tempo of the song "Spotlight" by Leagues. This song background was used in the series "Bridges". Every bridge is designed to span a chasm between 'here' and 'there'. Built to withstand pressure and constructed to endure force, bridges give us passage to an otherwise unreachable destination. In this special Easter message, Ed Young looks at the ultimate bridge. And as we discover how Jesus spanned the greatest chasm, we also see what it takes to move our lives from here to there...forever. I want to welcome everyone here. We have many different environments. Right now we are seen live in Miami, Midtown Miami, South Miami. I’ll be doing a service tonight down there. Plano, Downtown Dallas, Downtown Fort Worth, Columbia, South Carolina, and our online audience. Happy Easter! Happy Easter! You know, Easter is the time of good news. It really, really is. And I know we’re in overflow in a lot of areas here and at our other campuses. They were texting us and wanted me to do a shout out to everybody, also, who are in overflow. They’re telling me even in the overflow of the overflow. Well, you see a bridge behind me. See that bridge? I asked that construction team to build that and they did a fantastic job of this bridge. I don't know if you heard about it. You saw it earlier but we did a service at Clyde Warren Park. Clyde Warren Park is actually a park on a bridge. It connects downtown to uptown Dallas. You’re probably wondering, why Clyde Warren Park if you’re Miami or South Carolina. It’s downtown Dallas. We had thousands and thousands of people. What a statement to the city of Dallas. I think the crowds were estimated at 7,000-10,000 people at our Good Friday service. And it looks like we’ll do the same thing next year. Every relationship encounters difficult times. We all face moments of trouble, times of disappointment when we are hurt and bitter. In those moments, there’s a choice to be made. In this message, Pastor Ed Young shows us the power of the choice to forgive or not to forgive. And by looking at an in-your-face biblical illustration, we discover the reality that forgiveness is really a bridge to take us to new levels in our relationships. Illus: Several years ago, when I used to share duties and responsibilities carting our kids from our home to school, we had some very interesting rides. You know, parents, you can kinda feel me. When you take your kids to school things happen. You hear a lot of stuff. And also you hear a bunch of drama and trauma. You’ve got fights going on, conflicts going on. Yes, Lisa and I have four that are now pretty much all adults, but back in the day when I would take them to school, I’m telling you we would get in the car and it would be ON! Like Donkey Kong, man! I like that, on like Donkey Kong. Fighting, conflict, sometimes tears, sometimes fists would fly. Bridges would get burned and all of these harsh words. Inevitably the words would come out of their mouths even though they didn’t really feel it they would say it. Usually this would happen on a bridge over a dam in a local lake. I started calling the bridge the Dam Bridge of Forgiveness. That dam bridge of forgiveness. That’s where the burned bridges would be rebuilt. That’s where the words would be said. That’s where they would listen to what I was saying, their father, and we would all travel over the Dam Bridge of Forgiveness. Forgiveness is one of the crucial aspects of life. We all have a desire for it, and we all have a need for it. We want forgiveness from others, and we ask for forgiveness from God. But what do we do when it’s our turn to forgive? In this message, Pastor Ed Young reveals four powerful, life-altering steps that lead to extending forgiveness to others. Because when someone has done us harm, that’s when it’s time for us to build a bridge and get over it. “Ed, I’ve been practicing medicine for decades. I’ve never seen anybody with the amount and the density and the quality of wax like you.” So I thought, I need one of these puppies. The WAXVAC. Well, I got it. You turn it on, put it in your ear… <whistling>… boom! Turn it off. Turn the light on and see how much wax you’ve vacuumed out of your ear. Here’s the problem. This thing’s a piece of crap. Because yeah, it might work in your ear. It might work in your baby’s ear. It might work in your cat’s ear. Not mine. I got some serious ear wax! I need like a vacuum cleaner situation. The WAXVAC. Pretty hilarious. They overpromise and under-deliver. A lot of people do that, don’t they? Especially when it comes to selling things. Overpromise, under-deliver. Overpromise, under-deliver. Today’s subject matter… unforgiveness. Resentment. Bitterness. Holding a grudge. It overpromises and under-delivers. Here’s the phrase that pays: Unforgiveness is unforgiving. Let me say it again. Unforgiveness is unforgiving. Unforgiveness is…. Yes it is. I launched this series called Bridges several weeks ago. Session 1 I said, Cross that bridge when you come to it. That’s a bridge idiom, a bridge saying. And we basically unpack the fact that man has tried to build a bridge from his side to God’s side. We said that every world religion is basically a colossal human construction plan that tells you and me to put on our hard hats, our goggles, our Red Wings, our tool belts, and we maybe can build a bridge from our side to God’s side. By being philosophical, by being smart, by keeping our nose clean. But, on our best days our bridges are about this big compared to the bridge … THE bridge, of Biblical Christianity. Because Biblical Christianity separates itself from all the other world religions. Biblical Christianity is unlike the other faith systems because Biblical Christianity says God built the bridge. He built a bridge. Something we don’t deserve from his side, from the divine side, to the human side, thereby affording us the opportunity to cross the bridge. The bridge is a cross, and we have to cross the bridge. Jesus lived righteously. He died sacrificially. He rose bodily. He has given you and me the capacity and the choice. We either cross the bridge or not. The good news of Christianity is the bridge has been built! The other world religions, they don’t really have good news. Work harder. Tighten up your tool belt. Buy some more safety goggles. When those Red Wings wear out make sure to buy some Ostrich Red Wings. By another piece of machinery… it doesn’t get you to where you need to go. We’re made for the bridge. The cross is a bridge, we have a bridge to cross. Every relationship takes us in a direction in life. Some relationships take us to great destinations; others lead us places we don’t want to or need to go. The question is, where are your relationships taking you? In this message, Pastor Ed Young gives us some biblical insight into choosing the right kinds of relationships. And we discover what it takes to have the kind of relationships that avoid the bridge to nowhere. Welcome! I want to welcome everybody and all our different environments. Today we’re here at our church in South Miami. We have two campuses in Miami, South Miami and Midtown. Wanted to do a big shout out to Fort Worth, I know Lisa is over there at Fort Worth. What’s up honey, how are you doing? I love you, you’re the greatest! Also, I wanted to say hi to everybody in Dallas, Plano, gorgeous Grapevine, Columbia South Carolina all of our online campuses. Wow it's good to be in church today! It is great, it’s great. Today I want to talk about one of my favorite subjects in the world to discuss. I want to talk to you about the force of friendships, the force of friendships. The title of my message though is A Bridge to Nowhere. Say it with me all the campuses “A Bridge to Nowhere.” You might want to jot these verses down because I'm going to go through these very very quickly and I want you think about the common statement may be the common words in each Scripture. I think you'll get it after a while. Luke 8:51 - When he arrived at the house of Jairus, he did not let anyone go in with him except Peter, John and James, and the child’s father and mother. Luke 9:28 - About eight days after Jesus said this, he took Peter, John and James with him and went up onto a mountain to pray. Mark 14:32, 33 - They went to a place called Gethsemane, and Jesus said to his disciples, “Sit here while I pray.” He took Peter, James and John along with him, and he began to be deeply distressed and troubled. Peter James and John, you got it! The best friends of Christ! If Jesus needed an inner circle I think it’s safe to say you need one. And I need one. Three questions I want you to consider today when it comes to your relationships. When it comes the relational world your friendships or even those people that you're talking to or dating. All bridges have some similar characteristics. They each have certain aspects that allow them to function properly. When those features fail, however, the bridge can easily fall. In this message, Ed Young parallels the characteristics of bridges with those in our relational world. 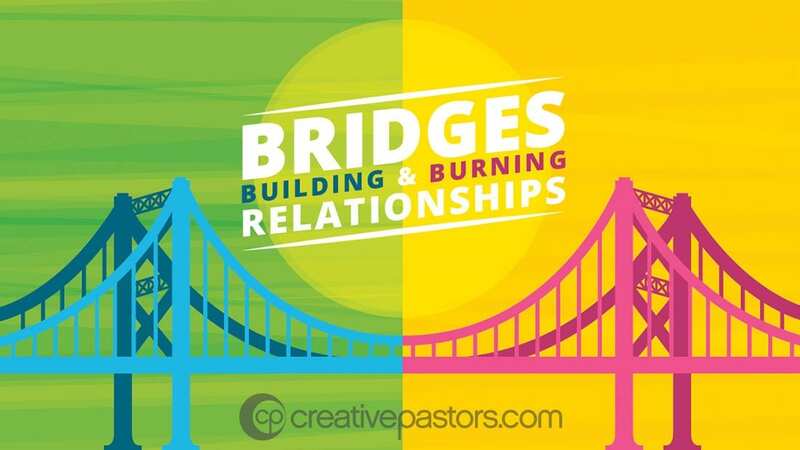 And as we discover the path and purpose God has for our relationships, we discover what it takes to keep our relational bridges from falling down. David Hughes: What is up Church by the Glades? Wow, great to see you today. If you’re our guest, welcome. I’m David Hughes, one of the pastors. We’re honored you’re with us. I can’t wait for what’s gonna happen in the next few moments. You’re about to hear a communicator, you’re gonna be so inspired and so moved, and so challenged, and so blessed. But before I tell you about our speaker there’s something cool happening. If you’re a guest, Church by the Glades is one church in two locations. We meet here, of course, at Sawgrass but also at Sample Road. Let’s stop and celebrate the Sample Road campus. The folks watch online. But today there’s a neat thing happening because or guest speaker, he’s the lead pastor of Fellowship Church. Fellowship Church originated in the Dallas area but now it’s one of the largest churches in North America. They have campuses in three states. They are in Dallas/Fort Worth, Grapevine, Plano, all that in Texas. They’re in Columbia, South Carolina. They’re in South Miami and Midtown Miami. And guess what? I’m not sure how all our smart techie guys do stuff like this. We have all these really just young techie guys with pimples and skateboards and they make amazing things happen. But we are linked up right now with the seven campuses of Fellowship Church. So Church by the Glades, let’s welcome Fellowship Church! We are so honored to have you with us. Thank you for sharing your pastor. And Fellowship Church, it gives us a moment to say thank you. Because I’ve got to tell you. You have imprinted our church in such a big way. My wife, Lisa, and I came to the C3 conference. They host this big conference for church leaders and pastors. We came, gosh, what, 11 years ago? And the Lord just blew our doors with your unleashed creativity and leadership. So you have imprinted us and thousands of churches around the world. I believe Fellowship Church is probably the most influential church in North America. So what an honor it is to have you with us and say thank you. We’re glad to have Fellowship Church with us, and their campuses. But we have a speaker today you’re gonna so enjoy. Our guest speaker today of course is the highly creative, inspiring pastor Ed Young, Jr. Ed leads Fellowship Church. He leads leaders. He has become a friend and encourager, a mentor. So guess what? Church by the Glades, I want more than that. I want you to do your best. Show them your hospitality! That’s right, Church by the Glades. If you’ll stand to your feet all over the house. Both campuses stand to your feet. Put your hands together, make a little noise. Make a little…. Bridges are designed to span a chasm between ‘here’ and ‘there’. They are designed to connect people from one area to people from another. Built to withstand pressure and constructed to endure force, bridges give us passage to otherwise unreachable destinations. In this series, Pastor Ed Young takes a look at some familiar aspects of all bridges. And he teaches us how the bridges we build can help us experience the kind of life God has in store for us all. Every bridge is designed to span a chasm between 'here' and 'there'. Built to withstand pressure and constructed to endure force, bridges give us passage to an otherwise unreachable destination. In this special Easter message, Ed Young looks at the ultimate bridge. And as we discover how Jesus spanned the greatest chasm, we also see what it takes to move our lives from here to there...forever. Every relationship encounters difficult times. We all face moments of trouble, times of disappointment when we are hurt and bitter. In those moments, there's a choice to be made. In this message, Pastor Ed Young shows us the power of the choice to forgive or not to forgive. And by looking at an in-your-face biblical illustration, we discover the reality that forgiveness is really a bridge to take us to new levels in our relationships. Forgiveness is one of the crucial aspects of life. We all have a desire for it, and we all have a need for it. We want forgiveness from others, and we ask for forgiveness from God. But what do we do when it’s our turn to forgive? In this message, Pastor Ed Young reveals four powerful, life-altering steps that lead to extending forgiveness to others. Because when someone has done us harm, that’s when it’s time for us to build a bridge and get over it. Every relationship takes us in a direction in life. Some relationships take us to great destinations; others lead us places we don't want to or need to go. The question is, where are your relationships taking you? In this message, Pastor Ed Young gives us some biblical insight into choosing the right kinds of relationships. And we discover what it takes to have the kind of relationships that avoid the bridge to nowhere. All bridges have some similar characteristics. They each have certain aspects that allow them to function properly. When those features fail, however, the bridge can easily fall. In this message, Ed Young parallels the characteristics of bridges with those in our relational world. 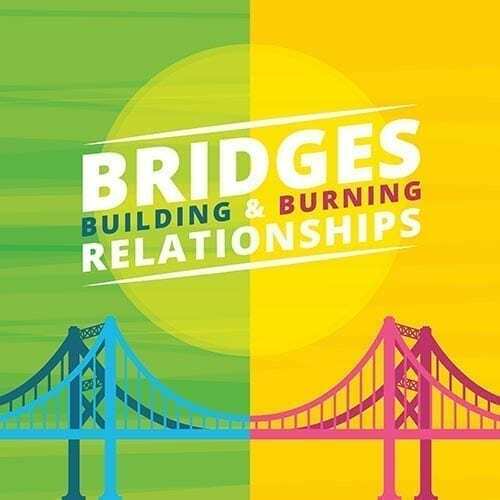 And as we discover the path and purpose God has for our relationships, we discover what it takes to keep our relational bridges from falling down.